This is my review of the IHG Rewards Club Mastercard credit card. The IHG Rewards Club Mastercard is issued by Creation Financial Services (part of French bank BNP Paribas) and earns points in IHG Rewards Club. IHG Rewards Club is the loyalty scheme for Holiday Inn, Holiday Inn Express, Crowne Plaza, InterContinental, Indigo, Staybridge Suites and Candlewood Suites. There is also a second version of this card, the IHG Rewards Club Premium Mastercard, which carries a £99 fee. The IHG Rewards Club Premium Mastercard is reviewed here. The paid version is a far better choice for high spenders. What is the IHG Rewards Club card sign-up bonus? You will receive 10,000 IHG Rewards Club points when you spend £200 within your first three months. This is worth 2,000 Avios or other airline miles if converted directly although you will get more value using them for hotel stays. There are some IHG Rewards Club hotels where you can get a room for as low as 10,000 points, although most big city properties will be 25,000+. However, IHG Rewards Club runs regular PointBreaks promotions where 150 hotels around the world are reduced to just 5,000 to 15,000 points per night. You will receive free IHG Rewards Club Gold status for as long as you hold the card. You can see the benefits of being a Gold member here. It is not worth much in theory (no free breakfast, no room upgrade, 10% points bonus) but some hotels do give holders recognition and it should give you some priority when the hotel decides who gets the room overlooking the bins. Status members also receive a choice of 500 bonus points or a free drink and snack at European IHG properties. Your on-going points from using the card count towards IHG Rewards Club status and so will speed up your progression from Gold to Platinum Elite. The sign-up bonus does NOT count towards IHG Rewards Club status so it will not put you 10,000 points closer to Platinum Elite or Spire Elite. What is the IHG Rewards Club Mastercard annual fee? 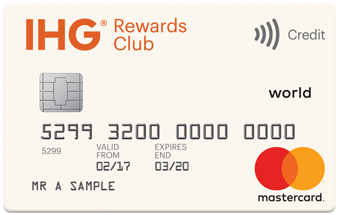 The earnings rate on the card is 1 point per £1 for general spending and 2 points per £1 for spending in IHG Rewards Club properties. You earn 2 points per £1 for overseas spend. Note that the IHG and overseas bonuses do not stack – if you pay for an IHG hotel in a foreign currency with the card, you only receive two, and not four, points per £1. Unlike the Premium version of the card there is NO free night voucher to work towards. Whilst this is always hypothetical, I tend to work on the basis on a top-category hotel costing £250 – what you would pay in New York, Paris or London inc tax. On that basis, an IHG Rewards Club point is worth about 0.4p based on a 60,000 – 70,000 point redemption for a room in an InterContinental in a major city. 1 point per £1 charged to your card is equivalent, on my numbers, to a 0.4% rebate on your spend. This is attractive compared to the rewards you would get from, say, the Tesco Clubcard Mastercard. 0.5% cashback is line with the value of the points offered by the IHG card. However, cash is substantially more flexible – and less susceptible to devaluation – than a hotel loyalty point! The IHG sign-up bonus is worth having – roughly £40 – £50 of free hotels stays. You may want to keep the card in a drawer, unused, to continue to benefit from the free IHG Rewards Club Gold status. You may also value the fact that the points count towards status with IHG Rewards Club – although, if this was important, you should pay £99 for the IHG Rewards Club Premium Mastercard which comes with Platinum Elite status as a benefit and earns 2 points per £1 spent. Is the IHG card a good card to use when travelling? Yes, to the extent that you earn double points (2 per £1) on foreign spend. American Express Membership Rewards stopped being an IHG Rewards Club partner in 2012. This means that, if you need to top-off an IHG Rewards Club account to get to a suitable level for a redemption, the credit card may offer an easy way to get the points you need. It is worth noting that you can also transfer Virgin Flying Club miles into IHG Rewards Club points at a 1:1 ratio. As a sign-up incentive, 10,000 points may get you a free night in a cheap hotel in a small city (worth at least £50) or 2,000 airline miles. If you got two PointBreaks nights out of it then you would have got a great result. An on-going earnings rate of 1 point per £1 is not hugely attractive. The John Lewis / Waitrose Mastercard offering 0.5% cashback in vouchers would be more valuable, unless you want the IHG Gold status. The application for the IHG Rewards Club Mastercard card can be found here. I have this card and pretty much only use it for UK IHG hotels (though ostensibly the Lloyds Avios Amex is better) and to generate a monthly direct debit for high interest current accounts. This card and the premium version is run by creation and I cannot think of a more inept company that runs credit cards. No app, appalling service, and no ability to download transactions easily to personal finance software. There are reasons to love Creation ???? Agreed…they’re a terrible operation, but they have their uses. +1 – bad service, when using the card for online transactions often get rejected so end up using a different credit card and they do not have an app. My experience has been great. Some fraudulent activity detected on Air Arabia (by them). In 2 days had a new card. Excellent card provider; waiting with bated breath for new Marriott card. I do not think their customer service is worse than Barclaycard’s – if anything it is better these days. I have neither perdonal finance software nor any device on which to run an app (and the apps that I have seen on other’s devices have been appalling compared with the equivalent website), so they are irrelevant for me. I think the downside of Creation is that they operate the Amex system of issuing points, rounding down to the previous whole £1 rather than issuing points on the aggregate bill at the end of the month, as Barclaycard still do, and MBNA did (and Halifax when they ran the Marriott card before it went to Creation, and NatWest, when they did AirMiles). Creation are certainly not the best but tolerable. Earlier in the year I was in the middle of nowhere in the midwest USA and the card kept getting declined, but very sporadically. Creation couldnt even tell me at first whether the card was blocked or not – they simply didnt know. Eventually they confirmed it was blocked but that I could unblock at certain ATMs but couldnt tell me which ones. They could see the Mastercard messages but didnt know what they meant. As it turned out the card wasnt blocked at all, just that the transaction was getting refused due to the card terminal having chip capability but the vendor trying to override it with the magstrip and not understanding the terminal message (as I say it was rural USA where chip payments are virtually unknown). That said I had fun from that point onwards when I waved my card in front of the one of the terminals as I saw it had contactless – the reaction was like an alien had landed from outer space! I’ve had this one for a while, and just recently taken out the Premium. Any reason for keeping the free one too? When I applied for the white card for the enhanced bonus a while back (I have the black), I cancelled it a few months later. No regrets. Have you by any chance taken out the white card again since? No. A credit search is not worth 10k IHG points = £40 IMO. Too low. I want at least £100 of profit per search. Interesting to hear the monetary value you put on a credit search. I agree 10k IHG is not much but I was thinking it might be worth having every 6/12 months if Creation would play ball. CC churn is the only thing my file is checked for. I have hopefully got all the mortgages I will ever need and have no interest in finance for a new car/roof/sofa…unless it’s the rewarding sort of finance which comes via CC spend. If you are trying for the free night for £10,000 you will want to put spending on Black, so just another card on your credit record? Is there a free night after a year of you hit a min spend? Are you a Principal Hotels Applause frequent guest member? I have just been upgraded to IHG Gold because of this and I wasn’t complaining either as it was as it just got me Gold benefits and an unexpected upgrade to an Executive room at an IHG property in the UK last weekend. Just hoping it will now give me IHG points for a expensive cash stay at the St. Davids in Cardiff for the rugby next weekend. Difficult to tell from their website whether or not all properties have transferred to IHG yet. Thats what happens when you go to Cardiff to watch Wales play :-), should go to Twickenham like we are tomorrow, more choice in London so lower prices (although I expect the Boks will beat us!). Even speaking as an England fan, there is NOTHING like Cardiff on match weekend, particularly with the centrally located stadium. I also went to see Ireland/France in Cardiff at the World Cup and that too was amazing; so not just for Wales matches. Yes, have to admit had some great times watching rugby in Cardiff supporting both England & Wales (lived in S Wales for a couple of years) but not been since it changed to the Principality stadium & at least you can leave the stadium & go straight into the city without the scrum for the trains back to Waterloo! I have the white card and just got accepted for the premium one. Would I still qualify for the 20k bonus? +1, I did it about a month ago then cancelled white. Interesting test – let us know! I’ve just hit the spend on the black card despite already having the white – I got the bonus with no trouble. I’ve done this and got the bonus (last month). I have struggled for the past 2 years to get this card. I earn 6 figures a year, have loads of Amex cards and MBNA cards and still I get refused every time. Did anyone win an appeal with these guys or have a similar problem to start with? I’ve often wondered about whether HFP type people (high income, but probably apply for credit a lot more than average) have troubles with applications. I was turned down from a sim-only contract with 3 recently – which seems ridiculous given that I’m a home owner in London – almost mortgage free at only 30 and earn c. 80k a year. Mortgage free at 30 in London on £80k. Wowsers. What’s your secret? BOMAD? I always get turned down for phone contracts even though my credit history is good. After some research it turns out that a phone contract I had some years ago had a typo in my address, now when I apply for a new contract, they compare my correct address against that typoed version and decide my address history is inconsistent and turn me down. I churn mobile phone contracts aggressively and have done so for about 15 years. I normally have about four contracts on the go at a time, and probably take out two or three contracts a year. I have had the credit check turn me down about twice in that time. There’s no rhyme or reason to it – it just occasionally happens. I can’t imagine I am a profitable customer to any of the mobile networks, but I have a perfect record of paying my bills. Why would one churn phone contracts? Any nice guide or blogposr somewhere about this? @Mr. AC Price? I’ve a spreadsheet of all my insurance and other contracts (e.g. energy) etc and always look to get the best price at the end of the term. @Michael Jennings Thank you for the detailed write-up! I learned a lot and will be on the lookout for interesting deals of this type. Mr. AC you’ve got one going on with Amex Plat in front of your eyes. They clearly don’t care about welcome bonus £££s, 90K commission (£900) for 5 sign-ups then cancel the Plat, only after you have used PP for a few dozen lounge passes @ £20 these days of course. Do you have any existing cards that are run by Creation? If so then could you call them and offer to reduce the limit on an existing card held with them, to release some of your existing credit for a new card with them? Sadly I don’t have any cards with Creation due to constantly being declined. I really don’t understand it and despite appealing several times, I keep being fobbed off! Thanks for all the replies though, much appreciated as always. Anybody not combining this with curve? Are Creation charging fees for “Cash” or “Business Services” transactions that come through Curve? A couple of people have suggested that they are, so I have been running such transactions via Hiltons Barclaycard, which definitely isn’t. I’d rather run them through IHG Black so I can hit the 10,000 points for free night if I can. £10,000 I mean. Not 10,000 points. Anybody tried to put money into Interactive Investor with Curve and IHG card? Used to work but all transactions seem to be blocked now. Any ideas why?